Sorrel Sky Gallery in Durango is one of more than a dozen venues that participates in First Thursdays Art Walk. If you’re like us, you wait until the last minute to do your Christmas shopping. It’s OK. We can’t all be Pinterest perfect. But don’t rush out to a big box store and just grab whatever is on the clearance shelf. 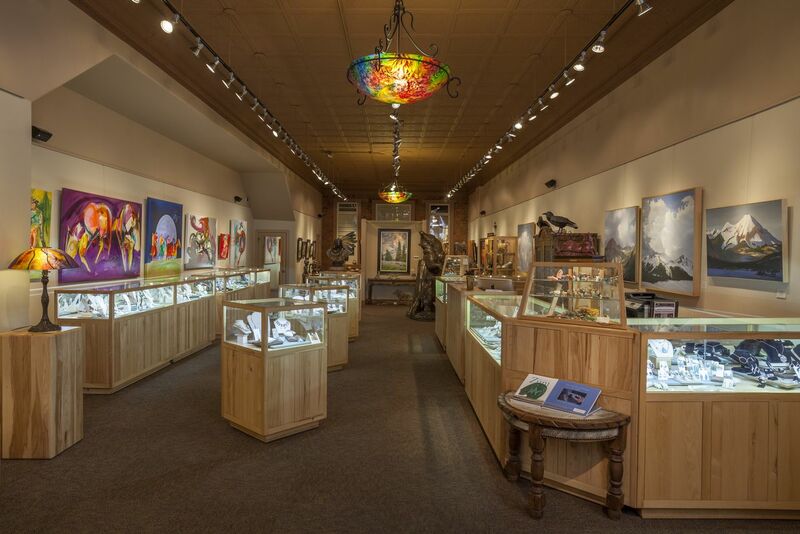 Durango has a great downtown packed with local boutiques, art galleries and speciality stores as well as a strong arts community that makes beautiful things — all perfect for the loved ones in your life. The Durango Arts Center will kick off its Winter Solstice Artisans Market on Friday, Nov. 21, with an opening reception from 5-7 p.m., and the event runs through Christmas Eve. The market features local and regional artists and their artwork — whether it’s wearable or intended to hang on the wall. Goods made by local artisans will including jewelry, ceramics, textiles, paintings, prints, drawings, photographs, metal, glass and wood pieces and paper goods such as notecards and stationary, just to name a few of the items that will be available. When you shop for gifts at the Winter Solstice Artisans Market, you not only support local artists, but also know you’re giving a one-of-a-kind gift! The artists market runs through 5 p.m. Christmas Eve for all you very-last-minute shoppers. The first Thursday of every month means one thing in Durango: art! First Thursdays Art Walk is a monthly gallery walk that features Durango art and artists at participating galleries and non-gallery art spots, like coffee shops and lounges. With more than a dozen participating venues, First Thursdays Art Walk is a perfect time to browse handmade, one-of-a-kind art pieces as possible Christmas gifts for your family and friends. During First Thursday, the venues host activities and artists from 5-7 p.m., and many offer hors d’oeuvres. Stop in at participating places to take in some art, have some fun and maybe sip a glass of wine! The Downtown Business Improvement District will host its Wondrous Winter Noel Night (formerly Holidazzle) on Friday, Dec. 5, which is the biggest shopping day — and night — of the year for downtown Durango. The annual holiday tradition celebrate’s the city’s local, independent businesses. Downtown boutiques, art galleries and stores will stay open late and offer holiday treats and warm drinks for shoppers, and the event includes a window-decorating contest among downtown businesses. Remember, despite the name, the event is an all-day affair! Don’t forget that Durango is home to five great craft breweries. Maybe a six-pack of someone’s favorite local brew, a growler of a seasonal ale, or some pint glasses from a brewery would be a perfect gift this holiday season. If you’ll be staying in Durango for the holidays, or need somewhere for your family to stay, remember to book your rooms with us at the Durango Quality Inn!